Can you believe the GlosBiz® initiative started 7 years ago with a simple, rather random tweet? It was the first time the #GlosBiz hashtag had been used, and the rest, as they say, is history (well, sort of, anyway). From that ‘standing start’, it has grown into Gloucestershire’s largest business network, with its networking breakfasts and business lunches consistently rated “the best business events in the county”. But, I am often asked what has made it so popular, so successful, so well-known? So, here are just three ‘principles’ that I always try to apply in business, and especially to the GlosBiz® initiative. 1) Customers want what they want – so give it to them! For me, this goes back to Stan Davis’ great book “Future Perfect”, which I first read around 25 years ago. Since then, I have firmly believed that main ‘rule’ of worthwhile customer service is simple – give them exactly what they want! When it comes to business networking, by far the most valuable thing I have learned is to give people the chance to build relationships, to be themselves, and to get to genuinely know others. They do not want to be told what to do, where to sit, when to swap business cards, and so on, for the simple reason that they are perfectly capable of doing those things for themselves! 2) Treat everyone you meet equally (no matter how hard it is, sometimes)! 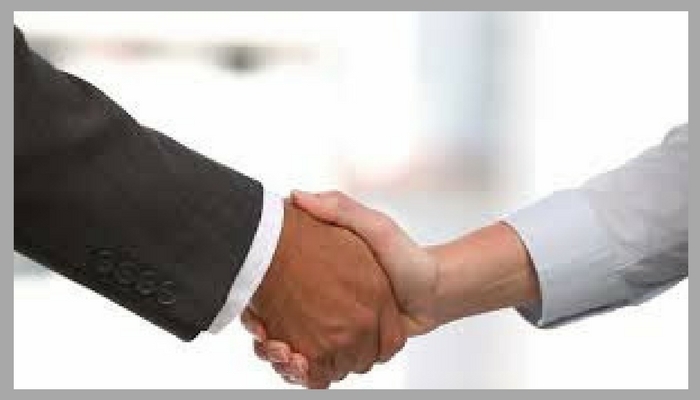 As I am sure you can understand, I meet many, many business people, and one key element of the GlosBiz® success story is that no matter who they are, what they do, or what size their company, I always try to treat them all the same. Needless to say, when I’m wearing my ‘GlosBiz® hat’, I don’t always get it ‘right’ – but I am only human! It can also be quite a challenge to do this consistently…and I’m sure you know what I mean? However hard you try, there will always be things that get you attention and tempt you to alter the ‘winning formula’ you have worked so hard to build. No doubt, you have heard the adages, “think twice, act once”, and , ”if it ain’t broke, don’t fix it”? Always, always, always stick to what you know works best, keep it as simple as possible, and remind yourself to think clearly at all times. GlosBiz® is a registered trademark. 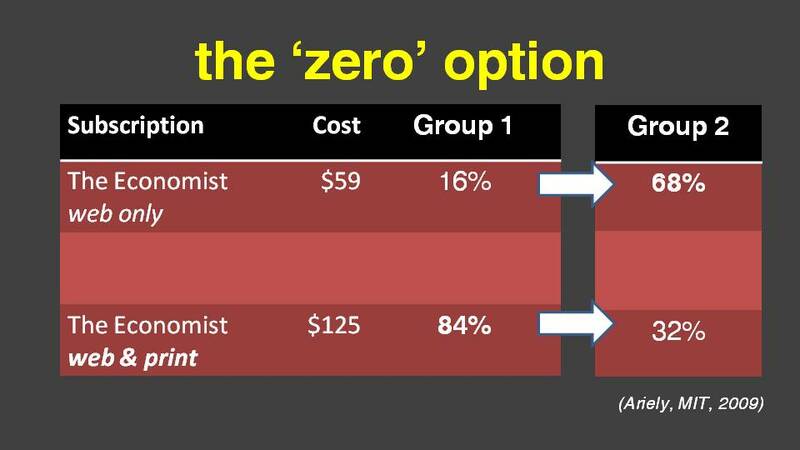 We come across ‘zero’ options – the ones that obviously nobody would choose – surprisingly often. But, what is the point of them? If they really are ‘useless’, what are they doing to our decision-making? In a controlled test, 100 MIT students were asked to express a preference – see the results shown above. So, if the print only option is a ‘zero’ option (i.e. : nobody chooses it), what is the point of including it in the list? Or, to put it another way, what would happen if it wasn’t there? 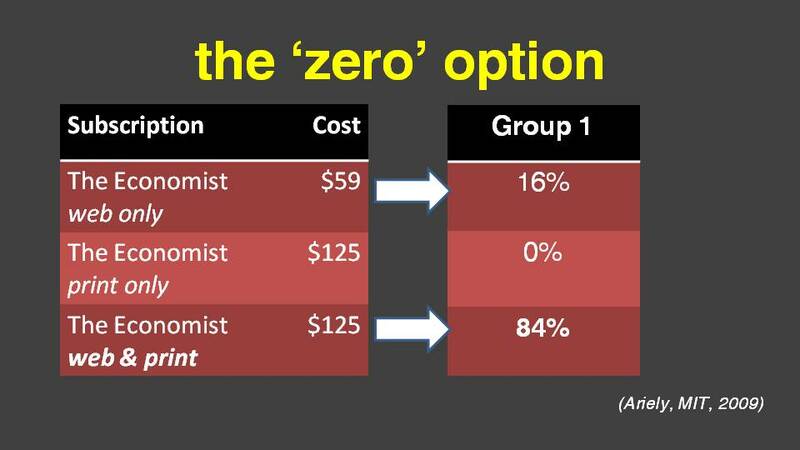 As you can see, when there were only two choices, what was originally the most popular has become the least popular, and vice versa, meaning the ‘zero’ option was actually having an influence on the choices the students were making. In fact, it wasn’t actually a ‘zero’ option at all. Just because nobody chose it, doesn’t mean it had no influence. What was happening was the only ‘zero’ element of that option was that nobody chose it. When it was present, it’s influence on the choices that were made – predominantly cognitive decisions – was important. What it was actually doing was encouraging the readers to choose the ‘best nearest’ option that was closest to the (obviously) ‘zero’ option. In other words, it helped the readers to make their minds up! So, next time you see a ‘zero’ option, or if you decide to include one in your own proposals, remember that they’re far from useless after all! They actually help the reader make a decision. Business networking: is it building your business, or holding it back? A successful network is a many faceted thing! Hands up all those who undertake some ‘networking’ from time to time? In reality, almost all of us do it, in some form or another, almost all of the time, don’t we? But is your ‘networking’ giving your business the best chance of growing, or is actually holding it back? As always with these things, it’s very much a case of working out which network development opportunities are best for you and your business. In other words, everyone you meet could potentially be a great contact for you. Tell people what you do (have an impact!) not your job title! Let them know about your AFTERs – what they will be left with after they have worked with you! Differentiate yourself from your competitors, and finally…. Say less, not more, and don’t waffle! 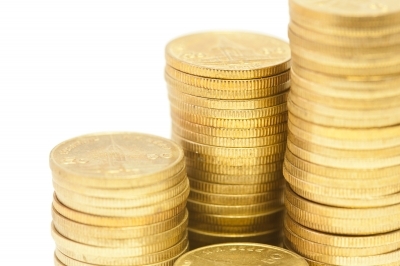 Think of the customer that has paid you the most money over the last year. What did they do? Think of the customer who was the most enjoyable to work with over the last year (even if you didn’t charge them anything). What did they do? Think of the customer who created the greatest success for you over the last year (e.g. : raising your profile, great PR, etc). What did they do? Obviously, developing that successful network will take a lot more too, but hopefully these tips will get you going. Drop your obsession with ‘being in busYness’! Have you noticed there’s something of an obsession among ‘business people’ to be seen as constantly, and dare I say chaotically busy? There seems to be an almost unwritten ‘law’ that telling everyone you meet how excessively busy you are is somehow good for their business. But what does it actually do for their business? What messages does it send out? Is it really what current and potential customers want to hear? Most importantly, are these people just busy being busy, or are they actually busy being productive? There is a huge difference! I’ve made a study of over 100 micro businesses over the last 2 years, and here are the conclusions. Unsurprisingly, the people who are busy being productive are very much in the minority – typically just 1 in 10 at best. The remainder are, quite literally, busying themselves with what they consider is ‘being busy’, yet have very little output to show for their efforts. In many of these cases, they have a firm belief that filling their time with what they consider to be “essential” or “important” tasks is good for their businesses, sends out a positive message, and as a result they are “too busy” to do other things (which would improve their productivity). But what are the causes of this obsession with busyness? Well, from the businesses I have looked at, it’s fundamentally about being disorganised – poor diary/time management, not prioritising the necessary tasks, not thinking clearly about being productive instead of just being busy, and consistently not understanding the full requirements of each task (including what they would deliver, how long they would take to complete, what the whole task requires, and so on). So, how can you improve your productivity and free-up more of your time in the process? Make a list of your essential tasks first. Then note down everything you need to complete each task (and I do mean everything): whose help/input you will need, what materials and other resources you need, deadlines, etc, then work out how long it will take to complete fully. Prioritise these tasks – simply compare each task with all the others, and decide which task in each comparison is most important. The number of ‘wins’ from each comparison that each task gets, gives you your prioritised list – the more ‘wins’, the higher the priority. Give yourself feedback on how successfully you increase your productivity – do you estimate enough time, do you remember everything that each task requires, how is it benefiting your customers and your business, and so on? © Adrian Malpass 2015-17. All rights reserved. Networking: the centre of the onion! I am often asked what networking is ‘about’. Needless to say, there are as many views on networking as there are networking events, just about everyone wants to get more from their networking, and those who say it ‘isn’t working’ for them are usually the ones who go about it the wrong way. Firstly, let’s look at how networking goes wrong. About selling there and then! Now, the simple, easy things you can do to get your networking right! About listening and being genuinely interested in the people you meet! Remember, building a great network that works for you and those that are connected to you is like being in the centre of an onion. Try to build layers of people you know – get to know 10 people well, and let them get to know you well too, and they will each remember you to 10 others as they network. So spending the time and effort to build 10 really good relationships, could increase your network by 100 connections. Especially remember most of all that networking isn’t all about you! Refer and connect those in your network who you have good reason to. Business alphabet: N is for…saying ‘No’ (occasionally)! When was the last time, in business, that you said, “No!”, and meant it? It doesn’t happen very often, does it? Not least because we have all been led to believe that saying ‘no’ at any time in business is a bad thing. sometimes, it is simply the right answer, so say it! New thinking = new results! The elephant in the room: Engagement! Perhaps one of the most important skills for anyone in business, or any other part of life for that matter, is the ability to genuinely engage with our fellow humans. For the purposes of this article, I will look at what is required for great engagement from an emotionally intelligent aspect. The understanding of emotional intelligence (‘Ei’) and its influences continues to develop apace. There are key, measurable elements of Ei that contribute significantly to our ability to thoroughly engage others, and I have described four of these below. Firstly, let’s look at awareness – how aware we are of our own feelings telling us what we want, like and need, and how well we balance that with how aware we are of others’ feelings telling them what they want, like and need. Keeping our ‘self awareness’ and ‘awareness of others’ in balance is essential to high levels of engagement, and key to developing our Ei. Can you tell when you’re ‘having a bad day’? What effects does it have on you in terms of your emotions, your thoughts, and how it influences how you behave? Now, can you tell others’ emotions, and adapt your thoughts and behaviour accordingly in order to engage them successfully? The next to look at is your ability to connect (sometimes called ‘personal connectedness’ in Ei journals) – how well you create and build significant connections with others by sharing yourself with them. Really, this is self-explanatory, although the ‘sharing yourself’ is more about letting the listener know you’re a ‘genuine’ human being with interests, habits and foibles, just as they are. Then there is authenticity (sometimes called ‘invitation to trust’) – how well you invite others to trust you. If you analyse what builds trust, it is mainly because the other person displays their principles (which they stick to), they are reliable (they do what they say they’re going to do), they’re consistent (in terms of their views and their behaviour), and you get a chance to ‘know’ them (reassuring you that they’re a ‘real’ person, not a robot!). How well do you demonstrate your principles, your consistency, your reliability and let others get to ‘know’ you? Your success at engaging others depends on it! Finally, for this article, is how you build trust with others accurately. In simple terms, we should build trust in others based on the evidence they present to us. The key is to start from a ‘neutral’ point – neither mistrusting, nor over-trusting, but allowing trust to build based on the evidence. This ‘carefully trusting’ position allows you to build trust more accurately in others. If you trust them appropriately, your willingness to openly engage with them is higher. So there you are, four relatively simple elements of Ei, all of which, with practice, will substantially enhance how well you genuinely engage others, and, essentially, how engaged they will feel with you and how much more effective that relationship will be. 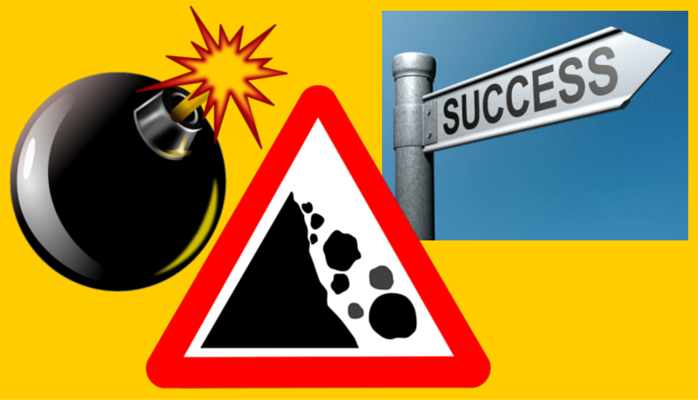 Are you in the coaching minefield? At this time of year, I meet many Directors and business owners who are actively thinking of hiring a professional business ‘coach’. “How do I find a good one?”. The challenges are that ‘coaching’ has become a rather trendy word, and the vast majority of people who call themselves ‘coaches’ actually have no idea what coaching is, and, more worryingly, have no professional coaching qualifications at all. So here is how I would go about it as a first few steps, although I would emphasise I have been involved in coaching for around 12 years, and completed my professional qualifications all the way back in 2004. Remember, your coach will have a significant impact on you and your business, so make sure you put in the time and effort to choose the right one! Firstly, I would ask any potential coach candidate to clearly identify the differences between coaching, mentoring, training, teaching and telling – there are distinct, and important differences. Any professional coach should easily be able to do this ‘off the cuff’. If you’re unsure what their answers should include, ask me! How do they work with a client? Do they want you to follow a ‘system’ they have developed or use (more common with newly qualified coaches who are building their experience portfolio, those who are unqualified or franchised ‘coaches’ (who, in my opinion, you;re best avoiding))? Or will they give you exactly what you and your business need? From the experience of clients who have come to me after working with the former, I would certainly recommend you avoid any coach who tries to get you to follow a prescribed ‘system’ as it essentially assumes the needs of you and your business are just the same as every other business….and, I can almost guarantee, they won’t be! Working with a coach who gives you exactly what you want will deliver the best results, and provide the best value for you. Are they a genuinely professionally qualified, experienced coach, or are they someone who has ‘been on a course’, or left their previous employment and decided to ‘set themselves up’ as a ‘coach’? Do they use their coaching skills with other useful skillsets (e.g. : mentoring)? Do they have coaching experience relevant to you and your needs? Their profile should, at the very least, help you to answer this. Then, look at their professional coaching qualifications. If so, which body were they obtained from? Warning! There are many, many ‘coaching courses’ out there that provide coaching skills training of a, being as diplomatic as I can, highly variable quality! Certainly, many of these are not of the standard you should reasonably expect in a professional coach. I would firmly recommend that you ascertain their coaching skills qualifications are from a UK university or a recognised, professional UK institute (e.g. : the CIPD or similar). These qualifications usually take 1 to 2 years to complete, let alone the professional development that follows. It is simply not possible to become a professionally competent coach after attending a weekend course! Probably only 10%-20% of ‘coaches’ are genuinely qualified, around 80% of which are women. So, you have checked out a bit about their understanding of coaching, their willingness to ‘publish’ their coaching experience and expertise, and that they are properly qualified. What next? Ask your network as it probably has far greater reach than you realise. How well known is your prospective candidate among your peers? What is their track record, and who can you find who would recommend them? Who has actually worked with them and what were the outcomes? Can you work with them openly and productively? Spend some time with them to find out. Ask any questions you have and consider their answers carefully. Remember that a coach may well be helping you to explore areas that are challenging to say the least, so trust is essential. What you pay for genuine professionals is built on the same principle the world over: you get what you pay for! If you come across a ‘coach’ whose charges seem surprisingly low, beware! Typically, a professionally qualified, experienced business coach will charge about the same as an accountant. So there you are. Just a few thoughts from me which will hopefully help you avoid some of the pitfalls and risks from choosing the wrong coach. 2014 – another year of client successes! Make your business boom in 2015! Here’s a round-up of my client’s successes in 2014. Growing a successful business is a minefield, especially as businesses are usually created by people who have a great idea, or who are really good at something in particular. You hardly ever come across people who start a business because they’re good at running a business. So here’s a ‘picture’ of how working with a specialist at growing and running businesses can take your business to new heights. So, are you ready to give your make your business boom in 2015? Needless to say, I’m often asked, “How can you help my business?”. I could waffle on, probably endlessly, about the importance and benefits of achieving excellence in your leadership, business management and how you manage your growth, and by bringing greater focus and direction to your business. After all, it is what I’ve been doing for over 27 years (and I learn something new every day). But, instead, I thought I’d let my client’s successes speak for themselves. So, how could your business benefit? Be ‘real’! Be emotional! Be a better leader! Your ‘human’ side can enhance your credibility. “Never apologise, mister, it’s a sign of weakness.”, so said the late John Wayne (and NCIS’ Jethro Gibbs). Goodness me! How times have changed! The more traditional view of ‘leaders’, particularly in the business world, is that they tend to be seen as ‘strong’, powerful, decisive, and never backing down. Yet, the very best leaders of today are those that are almost always recognised for their human qualities – being trustworthy, genuine, honest, open, show their emotions and, yes, vulnerable at times too (among others). Of course, the most important quality a leader still needs hasn’t changed much – the ability to make, often complex, decisions. However, whether your leadership ‘role’ is as the owner of a single person start-up, or as the global head of a £multi-billion business conglomerate, the way you connect with the people around you is key to your success. One of the most valuable ways to develop how ‘real’ other people perceive you is to reflect on your own experiences in meeting others. How many times do you meet someone, often who has a high ranking position in an organisation, who is intent on presenting themselves as ultimately professional, and presenting a rigid ‘mask’ to you? Being understood as a ‘professional’ is great, but have you noticed how time spent with those people leaves you feeling that the vital ‘connection’ sometimes isn’t there? This is simply because the ‘mask’ they put in front of you is not allowing you to connect with their ‘real’, personal qualities – something which we, as humans, intuitively want to do. So there you have it – by all means be seen as a professional, but make sure you allow others to understand you as a real human being and not some sort of robot. The higher up the business ladder you go, the more important it is to be ‘known’ by those around you, and reassure them of your principles, reliability and consitency, all of which significantly increases how you invite others to trust you. Click here for an article from Doug Sundheim on Harvard Business Review on ” Good Leaders Get Emotional”.